You do 30 J of work to load a toy dart gun. However, the dart is 10 cm long and feels a frictional force of 10 N while going through the dart gun’s barrel. 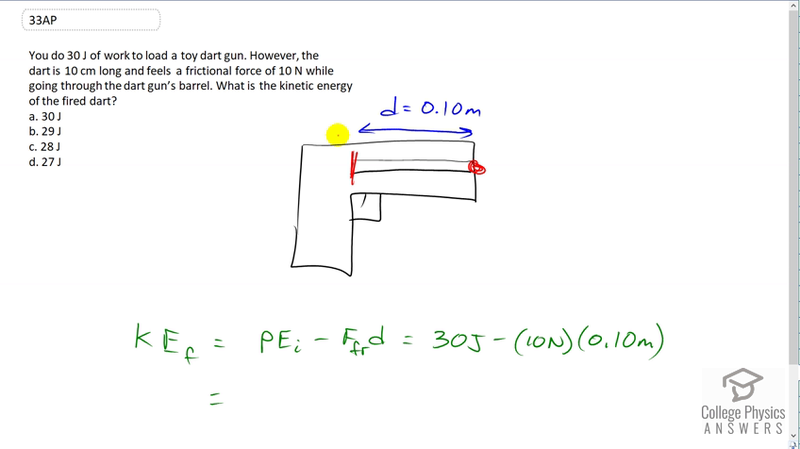 What is the kinetic energy of the fired dart? This is College Physics Answers with Shaun Dychko. The kinetic energy that the dart will have at the muzzle of the gun is going to equal the elastic potential energy that it has here, which equals the amount of work needed to compress the spring which is thirty joules, then minus the energy lost to friction. So that's thirty joules minus the force of friction, multiplied by the distance of the barrel and so that's 30 minus ten times 0.1 which works out to, well, 29 joules. That's answer B.